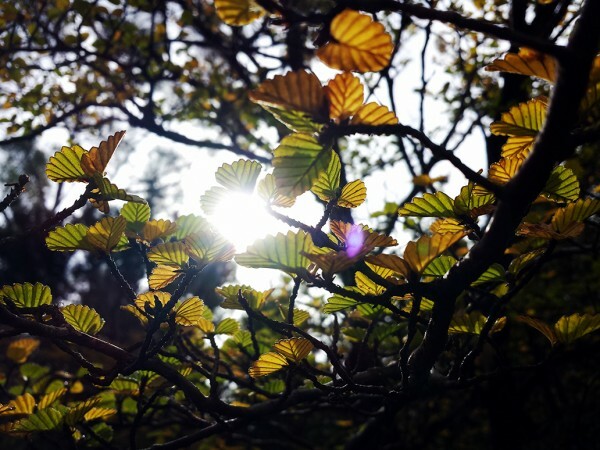 The Fagus (Nothofagus gunnii) or Deciduous Beech, is the only native deciduous tree in Tasmania, and is found at altitude, in hard-to-reach nooks around the state. Every year there is a photography pilgrimage to capture the ‘Turning of the Fagus’, which happens all-too-quickly for some, and at less and less predictable times each year. This year my photographer buddy Ben Short took me along for his pilgrimage – actually it took two treks into the wilds to find it – and I saw my first Fagus in the… frond! Typically, he brought his pro camera gear and I brought my camera phone. He fussed with apertures and filters and f-stops and all that other stuff I don’t understand… I just snapped happily away, breaking all rules and conventions of photography. See here, a lens flare! For shame! But I don’t care. I like this photo. These leaves are just the right sort of small and delicate (the size of thumb nails) to be challenging for a camera phone. How delightful! They look for all the world like butterflies ready to take flight. It was a fun photo day and certainly enhanced by the company :) The expensive gear that I fuss with still didn’t get that fabulous photo though. I just love the lit greens and yellows in this photo. Now we are both armed with proper hiking boots, I am thinking next year we may be able to tackle Tarn Shelf properly! I still haven’t broken in those darn boots! I should wear them around the house until my ankles rub off. But we’re also going to need some trekking poles for that climb. As much fun as it was that day – and it was a glorious, awesome day! – definitely need to be better prepared for the next climb.